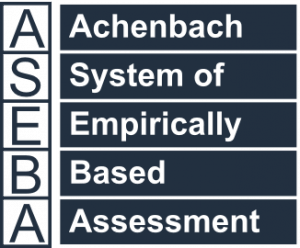 The ASEBA is a comprehensive evidence-based assessment system developed through decades of research and practical experience. The ASEBA assesses competencies, strengths, adaptive functioning, and behavioral, emotional, and social problems from age 1½ to over 90 years. ASEBA instruments clearly document clients’ functioning in terms of both quantitative scores and individualized descriptions in respondents’ own words. Descriptions include what concerns respondents most about the clients, the best things about clients, and details of competencies and problems that are not captured by quantitative scores alone. The individualized descriptive data, plus competence, strengths, adaptive, and problem scores, facilitate comprehensive, in-depth assessment. Numerous studies demonstrate significant associations between ASEBA scores and both diagnostic and special-education classifications (for references, see the Bibliography of Published Studies using the ASEBA). The ASEBA is widely used in mental health services; schools; medical settings; child and family services; multicultural assessment; HMOs; public health agencies; child guidance; training; and research.